As the saying goes "you can't get enough of a good thing". This proved to be true for this year's Supreme Winner for Large Manufacturers at the 2018 New Zealand Ice Cream Awards. 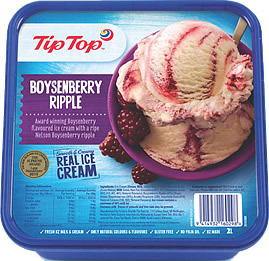 Tip Top Ice Cream's Boysenberry Ripple Ice Cream scooped the pool winning the Standard Ice Cream Category and 2018 Supreme Award. This is the fourth time this product has won the Supreme Award !! To quote the judges - the product "had great creamy texture and true to fruit boysenberry flavour and for a standard ice cream, it just continues to deliver." 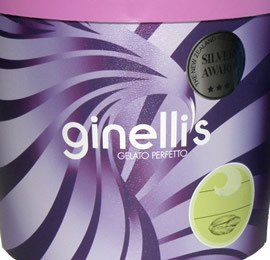 For the first time Ginelli's has won the Supreme Award for a Boutique Manufacturer with their Black Sesame Ice Cream. The six judges described this ice cream as "very creamy, with a very natural roast sesame flavour". Growth categories this year were Gelato with 58 entries and, continuing a strong involvement from last year, Sorbet with 61 entries. The Gelato category was won by Gellicious Gelato Ltd with their Cardamon, Ginger and Tumeric Yoghurt Gelato aptly named Indian Summer. This Gelato also won the New to Market Award - hotly contested by 91 entries. Best of Sorbet Category was awarded to a newcomer - The Island Gelato Company for their Tamarillo Sorbet. The kids from Clevedon School had to make choices from 21 entries in the Kids Choice Category and they chose White Chocolate and Raspberry made by New Zealand Natural as their pick for 2018. Tip Top Ice Cream also won Best in Category Standard Vanilla Ice Cream with their Creamy Vanilla Flavour Ice Cream. The Export Award was won by Much Moore Ice Cream Co Ltd with a Salted Caramel Swirl Ice Cream destined for Asia and the Pacific. Another newcomer to the Awards, Appleby Farms, won Best in Category for Premium Vanilla Ice Cream with their Bedford Vanilla Bean, made with farm fresh A2 wholemilk and cream. Changes in scoring of the Open Creative categories in ice cream and gelato/sorbet included an additional score for innovation and creativity. The entries this year certainly pulled out all stops to create some new and innovative entries including Maple Syrup and Bacon ice cream, Violet with White Chocolate ice cream, Champagne and Beer gelatos and Pomegranate and Hibiscus Tea sorbet. The winner across the two sections of the Open Creative category was Deep South Chip & Dip Ice Cream. This was a classic onion dip ice cream served with salt and vinegar chips that was created by Dairyworks. The judges' comments were "it tasted exactly as you used to make it at home". A classic well made Guilt Free Vanilla entry made by Talley's Group Ltd won the Low Fat Category, which must contain less than 3% total fat. The Non Dairy Award, introduced for the first time in 2017 has continued to attract more entries - 19 this year up from 12 last year. The winner of this category was PURE New Zealand Ice Cream with their Blackcurrant and Coconut Gelato. Again this was a record year for the Awards - highest number of entries to date (385) with a close-to-record number of 37 manufacturers who entered. One of the objectives of the Awards is to drive innovation and quality of New Zealand Ice Creams, Gelatos, Sorbets and Non Dairy Desserts. This is evidenced with the Best in Category winners being manufacturers based in Auckland, Wellington, Christchurch, Nelson and Wanaka, showing that there is a high standard throughout New Zealand. Historical information on The New Zealand Ice Cream Awards for the years 2000 through to 2017 is also available here on the NZICMA website. A full list of the 2018 Awards is here. 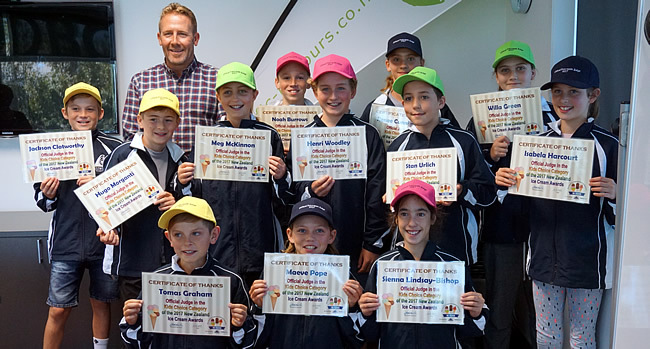 The Kids Choice Category was judged by girls and boys from Westmere School, Auckland (pictured above with Kid's Choice sponsor Clinton Fewtrell of Pacific Flavours & Ingredients Ltd). Thanks also to DuPont Nutrition and Health for their continued support and provision of our international Judge, Craig Davis. The structure of the Supreme Award changed in 2011 for the first time in its 15 year history. Instead of an overall Supreme Award winner, in recognition of the growth in small boutique ice cream and gelato manufacturers, there is now a Supreme Award for Boutique Manufacturers and a Supreme Award for Large Manufacturers. Boutique Manufacturers are defined as those who produce less than 500,000 litres per annum. The New Zealand Ice Cream Awards were introduced in 1997 by The New Zealand Ice Cream Manufacturers' Association (Inc.) to promote and publicise the high standard of New Zealand ice cream. 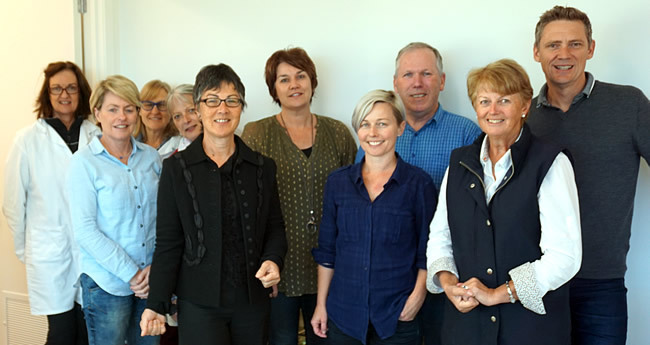 Judging is held in May (originally at the Massey University Institute of Food, Nutrition and Human Health (IFNHH), Albany campus; now at The FOODBOWL, Mangere, Auckland), 3 weeks prior to the Association's Annual Conference. Judging involves awarding points for a number of key attributes in different properties. Appearance is worth 10 points, Body and Texture - 30 points, Flavour - 50 points and Melting properties - 10 points. Gold Awards are given to entries with more than 95 points, Silver Awards to those between 90 and 95 points. Over its history there have been various categories for Standard and Premium ice creams, Gelato, Sorbet and Low Fat. A popular category has been Open Creative which was established to promote creativity in ice cream and frozen confectionery. Examples of entries in this category would be products made and served on the premises of restaurants, hotels and cafés, or produced by polytechnics, or R&D departments of manufacturers and suppliers. The Export category was introduced for products designed specifically for export and a Packaging category was also added to cater for Packaging only, to encourage innovation and creativity in packaging, as well as complying with the New Zealand Packaging Accord. Local schoolchildren are invited to be guest judges for the Kids Choice category. Then it comes down to rating each entry on a scale of "Really yukky" to "Really yummy" and choosing their overall favourite. There is a need for gender split between the guest judges as boys often have definite preferences from girls! Entries have the chance to win Silver, Gold, 'Best in Category' and Supreme Awards. Since 2011, two Supreme Awards have been on offer - one for Large Manufacturers, and a separate Supreme Award for Boutique Manufacturers. To qualify as a Boutique manufacturer, the manufacturer must produce less than 500,000 litres per annum. The New Zealand Ice Cream Awards are announced and presented at the NZICMA Conference Awards Dinner, usually held on the Friday evening of the Association's annual Conference. Full list of 2018 New Zealand Ice Cream Awards winners.